I just returned from presenting three classes at the Salt Lake City CAD Camp. It was a well attended event in downtown SLC. Matt Murphy “Revealed” several classes. David Cohn presented on Annotation Scaling for Text. There were Civil, Architectural and Manufacturing focused classes. I presented on CAD Leadership, Preventative CAD Management and working with BAD CAD. AUGI gave away an assortment or prizes ranging from computer bags,to sweatshirts and MP3 players. Here are some photos from the event taken by David Cohn  and Shaan Hurley . Many thanks to ProSoft  for making it a great event as the sponsor and also providing great speakers. Other sponsors and vendors on site included 4D Technologies  which does AUGI CADLearning.com  . 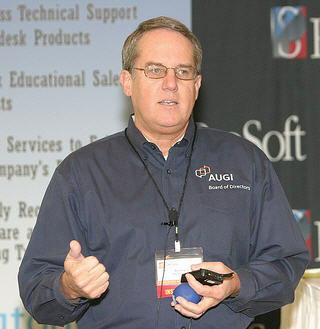 This site provides the FREE online e-training  for AUGI members. Attendees at AUGI CAD Camps also get a $150 discount off of the price of Autodesk University. So many good reasons to attend an AUGI CAD Camp . Are you going to one?